The Emporium of Dangerous Ideas aims to re-establish the importance of dangerous ideas as agents of change in education – to shift the axis of what is possible! It is for everyone who is passionate about education including college, university, school staff and students as well as those engaged in education throughout the creative communities. They’ve recently shared a great idea for remote workers or office workers working in education. Have you ever wondered what it would be like to work in a very different environment from your usual workplace? Would you like to try it out and become an office surfer? Would you like your organisation to Host an office surf? Would you like to meet people from other professions and sectors? What? … Spend some time in a different work environment, doing your work or work as a host, welcoming a surfer to experience your working environment. To become more aware of the physical work environment, and the effect it has on your work. Does your workplace help you to be creative? How is the new environment different? What about it is helpful? Any ideas you could take back and implement in your own workplace? To meet new people and have interesting conversations. The random coffee scheme that was organised by Education Scotland has put hundreds of people together for interesting conversations, and ideas have grown out of it. Benefits? to benchmark your own work-space against the one you are visiting, and against best practice, and come away with ideas for improvement. You both get and interesting and unexpected connection. If this sounds like a Dangerous Idea that you would like to be a part of, please contact Dawn Brooks for more information on how to take part. Any responses should be in by Thursday 30 April 2015. Over the weekend We took a trip down to Kent and had a day out in Rochester. It’s a really interesting place and those who have visited will know that it has many Charles Dickens connections. Down a little lane we found Charles Dickens’ two-storey Swiss chalet. The chalet used be in the garden at Gad’s Hill Place, Higham and was used as a summer study house. Dickens wrote many of his famous novels there from 1865 until his death in 1870. The chalet is currently in the gardens of Eastgate House in Rochester. So what struck me about the chalet is that it is essentially an elaborate remote working/home office/shed! Dickens must have struggled with many of the issues we remote workers struggle with – interruptions from family, messy working space, feeling the cold etc. Unfortunately the chalet is in a bit of a bad way and needs considerable restoration. There is an appeal to raise over £100,000 which hopes to sort out the wood rot and give the chalet a much needed make over. So it’s Saturday and maybe time for some light relief!? 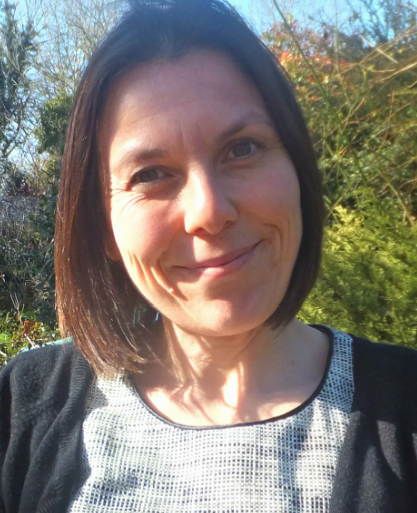 Rheney Williams has written a guest blog post for us on how you can boost remote productivity by having beautiful home office plants and flowers. Rheney enjoys sharing her DIY craft window ideas with others and writes about her projects for The Home Depot. Rheney has been busy this past year updating her Charleston, S.C., home with all manner of custom lowcountry touches. When you’re a remote worker, more often than not, you’re working online from a home office. And even if you have the most conducive conditions for working remotely (peace and quiet! ), we’ve all experienced that part of the day where you just need a boost. Whether it’s a mental boost because your brain has been working overtime or a creative boost because your imagination’s well has run dry, sometimes all you need is a bright pop of color to push your productivity back into forward motion. Basically, when you work and write online, it’s important to surround yourself with an environment that fosters free-thinking and a potted ‘office mascot’ may be just the thing you need to cheer you up and spur you on during the day! In addition to the bright burst of color that the blooms provide, plants are notorious workhorses in the air purifying department. And when you’re cooped up inside all day, a little bit of fresher air goes a long way! I’ve been considering candidates for my own home office mascot and I’ve finally narrowed it down to the perfect choice for me: African violets! I have a casement window that is just begging for a bit of windowsill dressing and the violets are it because although it is a bright window, its placement and direction on my house means it almost never receives direct sunlight. This is important for these little violets as they love bright conditions and indirect sunlight. Even if you don’t have a large, indirectly lit window, violets could still be the perfect choice for you too because they are some of the easiest indoor flowers to grow and don’t require full-on sunshine (or two green thumbs) to keep them alive. Their needs are a bit unique but once you address them from the beginning, the ongoing maintenance for African violets is minimal. Here’s a glimpse into how I planted my home office mascot for my windowsill and a few tips for establishing one of your own. Purple and blue are two of my favorite colors and two great options in your working area. The rich depth of the purple and the calming brightness of the blue, in pastel shades of lavender and sky, respectively, provide just the right amount of inspiration and creative spark when you need a pick-me-up but they don’t demand attention or scream at you the way other bolder colors seem to do. 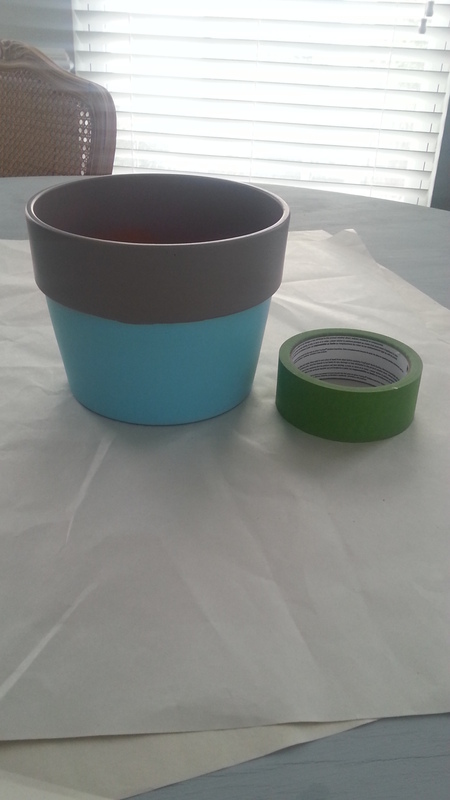 So I started building my mascot’s ‘home’ by painting a clean terra cotta pot with blue and grey chalkboard paint. *Tip: For African violets, make sure you use a shallow pot (or one designed specifically for African violets) because the more standard height pots are too deep to provide their optimal growing environment. After that dried overnight, I gathered everything else together and started adding the colorful details. Using the Frog tape as a guide, I taped off alternating segments around the rim and painted the insides with white craft paint. I removed the tape and painted over the remaining grey strips underneath with lavender craft paint. 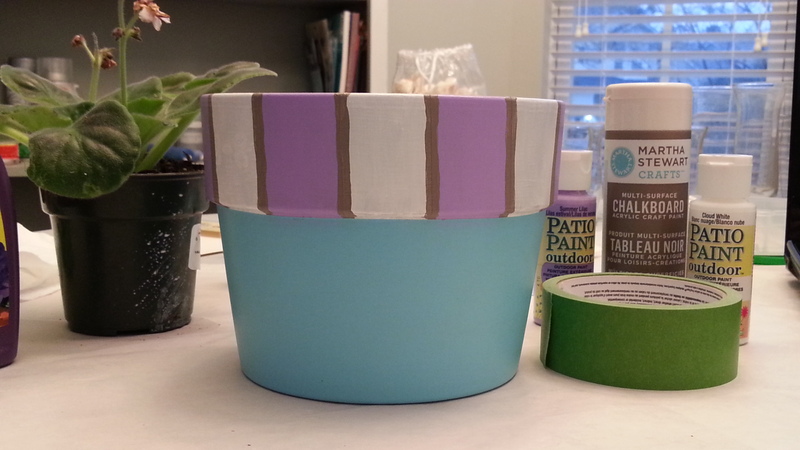 Finally, I painted a thin line of the grey in between each of the white and lavender stripes. Allow the rim to dry thoroughly before moving on to planting your flower. Cover the drain hole(s) with a flat stone to allow for the water to enter and exit while keeping the soil in the pot where it belongs. Fill the pot 1/3 or ½ of the way with potting mix. 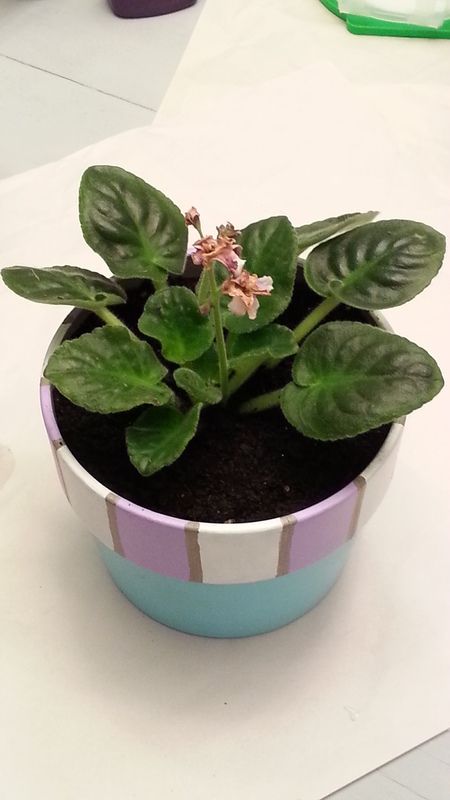 You can use the kind designed for African violets or make your own with an equal parts mixture of peat moss and perlite or vermiculite. Carefully place your plant into the pot and gently scoop soil around the edges, tamping down with your fingers as you go. Continue filling and tamping until the soil is about ½” below the rim and be careful to avoid getting dirt on the leaves and fuzzy stems. 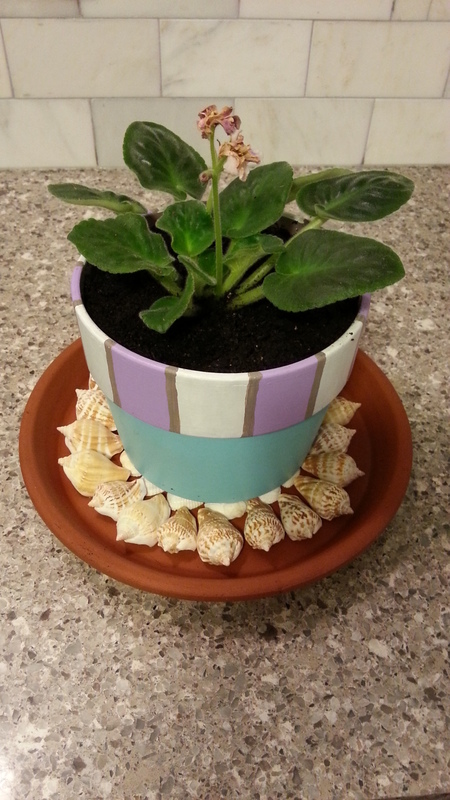 To create the most accurate representation of the African violets’ natural moist, humid habitat, line the bottom of a deep saucer or dish with pebbles for the pot to sit atop. 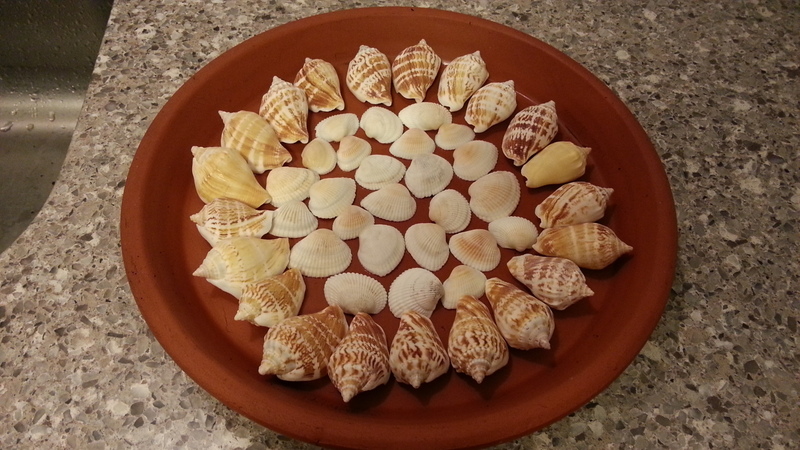 To recreate my natural environment, however, I replaced the pebbles with shells I collected from my native South Carolina coastline! The goal is to provide a raised bed for the pot that is filled with water to just below the pot’s base so that humidity swirls as the water evaporates below. This is also how you should water your violets ñ from below, never above. *Tip: If you ever do get water on the leaves or petals, do your best to dry it immediately as this can damage and burn them (if in direct sunlight). Keep an eye on the water level and when it drops, simply refill the base. 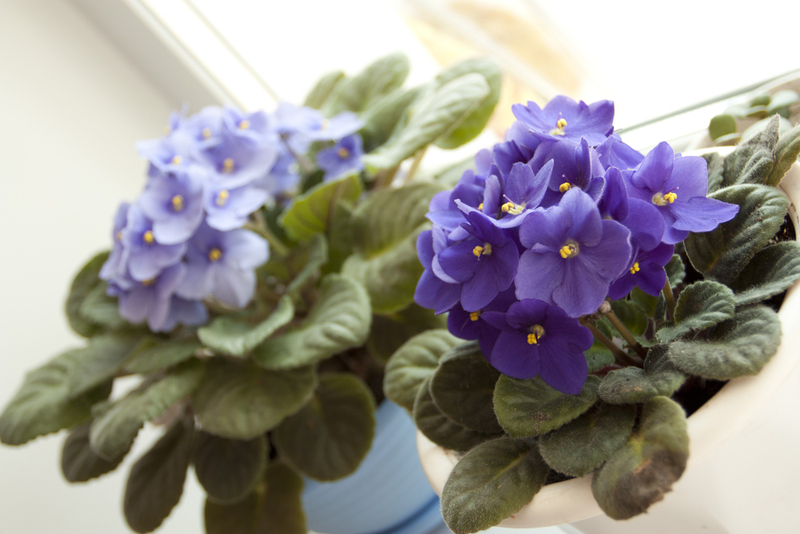 When you first plant your violets and every couple of weeks, add several drops of African violet food to the water to ensure it receives the proper nutrients. And that’s all you need for a freshly potted, bright office mascot that’s sure to boost your spirits and your creative productivity in no time. What type of flowers do you want to plant in your remote office? Kenneth McCall builds creative and innovative tools for customer seeking self storage units. Kenneth is a managing partner at storage.com which provides storage units in Miami and units in Florida and other Gulf states as well as around the United States. In his spare time he likes to get outside, ideally with a boat and water-skis.Ken believes that creating a clutterless workspace is imperative and allows you to be comfortable in your home office and find what you need. Possibly a contrasting piece to Josh Doyle’s post on Making the Office feel like Home. A cluttered office leads to a cluttered mind. Or maybe it’s the other way around? Either way, even if you’re comfortable in a little bit of disorganization, having a messy office only leads to losing important things, forgetting important appointments and above all, losing time. 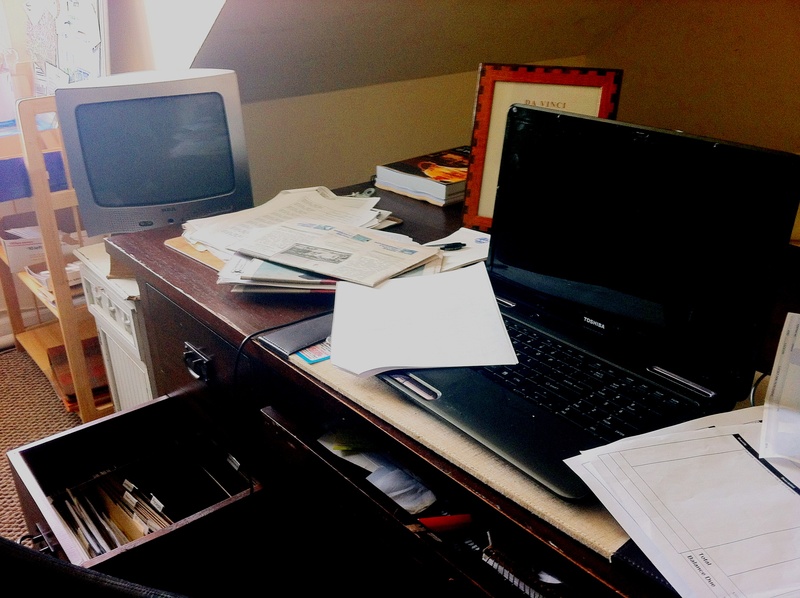 Not that long ago, I had a cluttered desk that could battle with the best of them. Papers were flung every which way. Reminders on sticky notes fluttered from random surfaces and bills lay scattered about the floor (with several featuring some forensically impressive boot prints). I hit the wall when I spent more than an hour trying to find a note I’d written while talking to my cousin about an upcoming family reunion. Pulling handfuls of random notebooks from a dusty corner, I determined that I had to clean this office. And I had to keep it that way or risk going mad or at least miss a lot of important dates. The first thing I found that you need to do when organizing your home office is make sure there’s room for everything you need. This might seem a little silly as the space might have worked fine before, but did you really have space for everything or were certain areas doubling or sometimes tripling up on their usage? That is, are your bill files in a stack on your workspace or are reference books being used as boards for sticky note reminders? Before digging into your scattered paperwork, make sure you have designated areas for your main office needs such as a workspace for your electronics, a reference area for your bills and reference materials, and a place for office necessities such as white-out, scissors, paper clips and extra pens. These spaces don’t have to be huge, they just need to afford you enough room to do what needs to be done and not overlap with another area. If your workspace is always clear except for your laptop and printer, it’s much easier to sit down and get work done as you won’t have to move and perhaps be distracted by random office items before starting work. While your workspace area needs to stay clear, the reference materials area is where you can start gathering all of your office miscellany and putting them in their appropriate places. The most important thing to remember is that everything should have a place. There shouldnít be a single item that needs to be in your office that doesnít have a place to go. If your filing cabinet is full or you donít have enough space for one, consider using wire filing racks or getting small, stackable filing boxes from your local home improvement store. You could even get a good piece of tin sheeting from a nearby hardware store and attach it to the wall. Using industrial magnets or just some good, strong magnet clips can turn your wall into a vertical filing cabinet for important papers and reminders. As for the rest of those documents floating around, I actually found a small desk scanner that works wonders for paperless organization. There are several different types out there, but the basic idea is that you can run important papers through a scanner about the size of a rolling pin and the information is immediately sorted and transferred to a program on your computer. You can access all of your papers with a quick keyword search and dispose of the paper documents appropriately. Once you have your spaces designated and clutter organized and cleared, try to take a couple moments every day to sort and organize. This doesnít have to be a long time, it could even take just a few minutes, but by stepping back and sorting a couple things here and there you save yourself the hassle of dealing with a much larger mess down the road. At the same time, a little brain break is a healthy work habit. It allows you to focus on something else for a little bit and then come back to your current project with fresh eyes. As I write this, my desk and office space are still clear more than two months after my home office overhaul. It takes some reminders every once in a while, but with a little effort, keeping a cleaner office will help you keep up with your work more easily and will probably even give you a better outlook on your work day. I know it did for me! 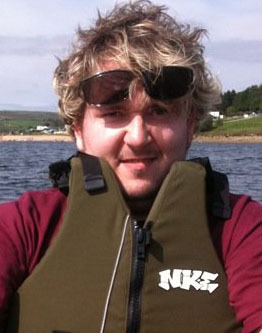 Josh Doyle currently works 3 days a week part time at a website company in the not so sunny seaside town of Weston Super Mare, he usually spends the rest of his week doing freelance work for a furniture company called Fit & Furnish. He admits to having a ‘messy office’ but feels it’s really important to feel at ease in your working environment…even if that means not dusting too often! He’s written a guest blog post for about how he has made his office feel like home….rather than his home feel like an office. For 3 days a week I spend most of my time helping people resolve email issues and other generic problems using remote software. To put it in its fancypants term I’m an IT support officer or “techie” to everyone in house and troubleshooting is my game. I’m not exactly a remote worker as such, as I do have to go into an office from Monday to Wednesday, But I’m constantly working on computers hundreds of miles away through the wonderful series of tubes that combine to form the internet. With that in mind I’m sure a lot of you remote workers have a nice comfy home office with everything you need at your fingertips. I’ve tried to re-create this feeling at my office, Sure, I get some strange looks from my co-workers but I feel that it’s most definitely worth it. 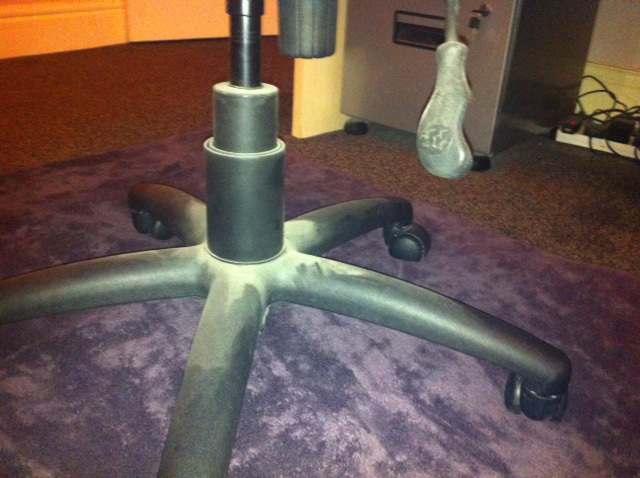 I find there is nothing more comforting than having a nice thick carpet under your feet as you tap away at the computer, that’s why I’ve brought my own homemade carpet mat into the office for my chair to rest on. It might be a bit more difficult to roll the chair around now, but it does feel a lot nicer under my feet than the strange astroturfy office floor! My terribly messy desk. 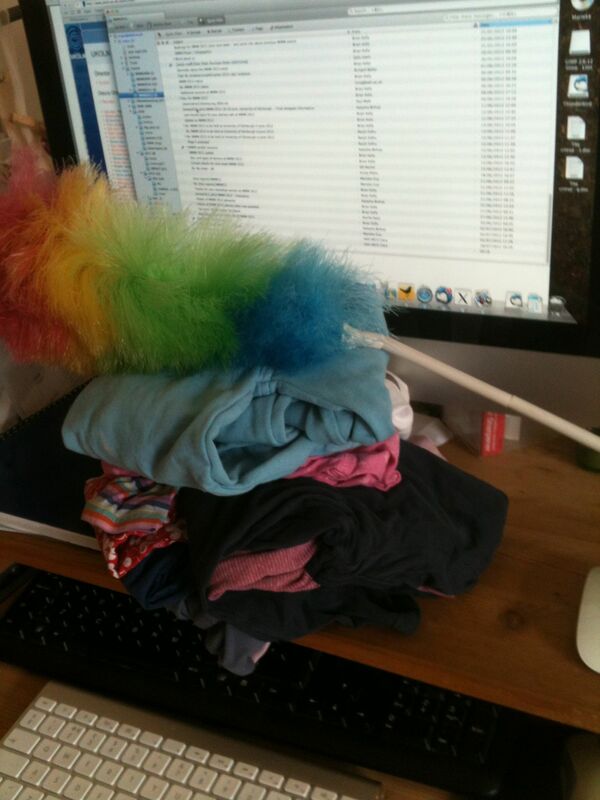 I do clean.. sometimes… honest! The standard cheap keyboard and mouse combo you’ll find at our office is another nightmare; one of my pet peeves is not being able to glide my cursor around the screen with ease. I was forced to bring in my beautiful black Ergonomic keyboard and mouse, well, at least they save my wrists from falling off. A nice soft table/mouse mat to go with these really takes the strain away from your hand. I seem to have been developing a ball on lower right surface of my palm my wrist meets the table, so I decided that a mat would probably be the best way to curve this issue. People say an office chair is possibly the most important part of your office, I didn’t go as far as buying a new one as I’ve found the comfier ones are ridiculously expensive, I did however bring in a nice cushion that makes it much more comfortable to sit with the correct posture. You have to make to with what you can when you’re sitting down for hours at a time. 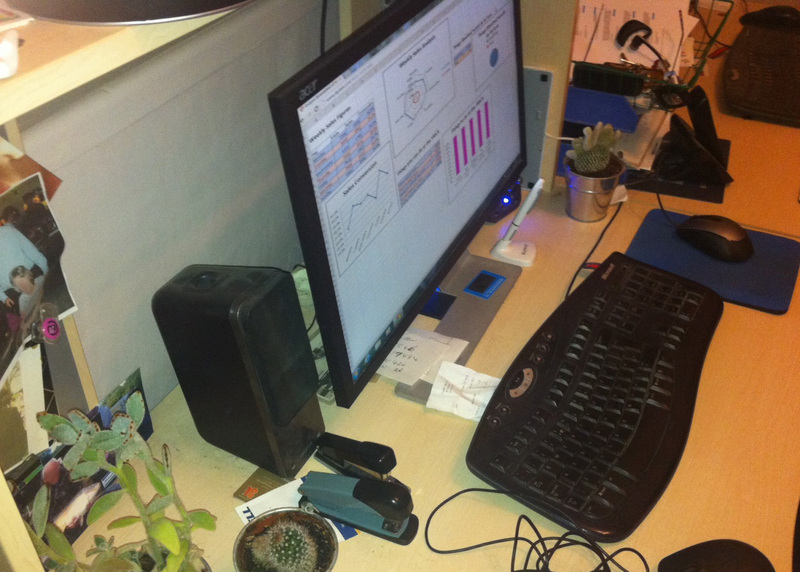 Even very small bits and pieces can make a big difference, A nice picture of your partner and even a few nice little plants to go on the desk and drown out that office smell really can help as well. One thing I doubt I can live without is my mug, having countless cups of coffee a day would just not be the same in a generic office mug. On the Monday I bring my favorite home mug with me and then take it back with me on the Wednesday, perfect! It only takes a few things to make my office feel more homely, and not at a great expense! I found my productivity did benefit from the changes, even if my area of the office looks a bit mental!! A freelance blogger with a strong work ethic, Angelita Williams lives for scooping the next big story. She grew up idolising the women in journalism who paved the way for future generations, so that people like her could make a living by writing current events. Angelita has traveled around many parts of the US honing her skills as a writer and storyteller. Among her preferred topics of writing are online learning, distance courses, and the growing trend of mobile education. If you have any comments or questions, you can reach Angelita at angelita.williams7@gmail.com. Working from home: it’s the holy grail of employment situations for many people who wish they had an alternative to sitting at a dreary desk from 8-5. The idea of getting paid to do work from the comfort of your home, to make a living without ever donning an dress shirt or a blouse is quite literally a fantasy for millions of office workers. There’s no doubt that working from home lends itself to a more flexible and free working environment compared to most office jobs. But there are limitations, and there are disadvantages to working from home that most people don’t consider when they visualize doing their work from their bed or from their living room. As someone who has often worked remotely in her career, I can attest to the trials and tribulations that accompany a work from home lifestyle. Allow me to inject some reality into the fantasy of remote working by explaining some of the disadvantages that go along with it. It’s hard to get (too) distracted in an office. Sure, you can “accidentally” surf the web for an hour, but beyond the temptation of music blogs and checking out the latest posts on your Tumblr, there’s not much to prevent you from working at a traditional office. Do you get distracted by housework? It’s an entirely different story when you’re working at your house. You won’t believe the number of tasks you’ll try to take on if it means prolonging your workday for a single minute. From my own experience, I’ve done the laundry, cooked a meal, finished painting a wall in my guest room (really) and taken any number of too long lunch breaks. When you’re home, it’s easy to excuse anything that distracts you from work as worthwhile because you can chalk it up to a chore that needed doing anyway. But the fact of the matter is that you’re at home to work, not to check off things from your housework to-do list, and sometimes it’s hard to remember that. There’s something to be said about the distance between traditional office work and your home. At a typical desk job, you get up, get ready, commute to the office, do your work, and go home. When you’re working from home, you get up and start working right there. While remote working cuts down the time it takes for you to get ready for work, it also eliminates the separate space reserved for doing that work. If you don’t take your work to a coffee shop or some outside venue, you could risk spending the majority of your days in your own house. It can be a problem when work and home share the same space. In a sense, there’s no escaping the immediacy of your work. At a desk job you go home on a Friday and (typically) don’t think about work until you get back the following Monday. When you work from home, projects and imposing deadlines can sneak up on you all the time, because you don’t have a separate space to compartmentalize your work life. Finally, working from home can complicate your perception of an adequate workload. Some people take the freedoms of working from home to pour themselves into their work, finishing projects and writing material at a much faster clip than they did at their office jobs. But without the traditional boundaries set in place at a workplace (everyone leaving the office at 5, lunch breaks, etc. ), these same hard working remote employees could overwork themselves just because they can. There’s no one around to stop them, and so they work for much longer than they should. Of course the opposite scenario could also occur. With all the built in distractions of working from home, it’s easy to imagine the unmotivated remote working watching a few movies during office hours, or surfing the web for the entire day. Without a supervisor to, well, supervise them, undisciplined remote workers might fall behind in their quotas or on deadlines, and risk their jobs in the process. Do you work from home? If so, what disadvantages have you encountered while doing so?